"Where are we going to get aggregates in the future?" Local opposition and complex permit requirements are stymieing new sources. 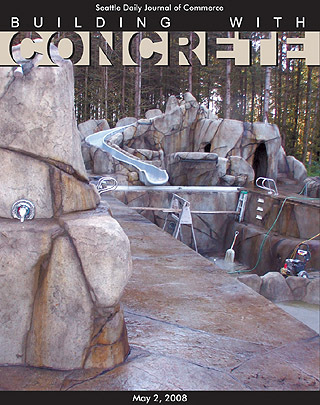 "Pervious concrete gets the Midwest test"
A private swimming pool in Carnation was one of the category winners in the Washington Aggregates and Concrete Association’s Excellence in Concrete Awards. The pool is flanked by a 20-foot-tall shotcrete mountain with water slide running through it and a cave inside it.